Been waiting to see you. We’ve been waiting for this moment all day long. Are you excited to see Clay Aiken tonight? Did you see Clay’s tweet on Wednesday? So far, the tweet has 176 re-tweets. Have you retweeted it yet? The newsobserver.com – happiness is a warm tv – posted a short mention about Clay and Fantasia singing on American Idol tonight. North Carolina is getting plenty of exposure on “American Idol” this season. 2011 winner Scotty McCreery performed on “Idol” last week, and the show welcomes back 2003 runner-up Clay Aiken (left) and 2004 winner Fantasia Barrino tomorrow night. “American Idol” airs on Fox at 8 p.m. on Thursday. Many people believe that March 17, 2004 was a defining moment in the career of Clay Aiken. 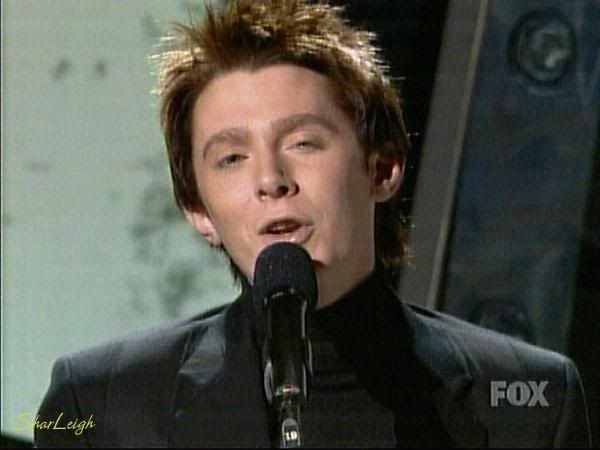 It was Results Night and American Idol invited Clay Aiken, the runner up of Season 2 as their musical guest. At about the halfway mark of the show, Ryan Seacrest announced Clay. He strode onto the stage in a commanding way. He was wearing a black turtleneck and a suit. Instead of standing in front of the judges’ table, Clay chose to perform at the side of the stage. Clay chose to sing Solitaire as it was being pushed as his new single. For some reason, Fremantle International has taken down all the videos of this wonderful performance…I wish I understood their logic. However, the following video by Wowzers4clay is wonderful. The pictures are amazing and the music puts you right into the theatre! Plus…you get the bonus of Clay performing Fantasy on American Idol. You can BET I will be watching tonight!!!! Sooooo excited!!! I can't wait for tonight, to see Clay! So excited too!!!!!!! Wow wow wow! I just watched this video twice, love it, what a gorgeous voice Clay has, never get tired of it, can't wait till tonight, the anticipation is killing me! This will be another one of my recorded saves of Clay's appearance on TV. Thanks Musicfan xox. I don't think it's possible to be any more excited than I am!!! Was "HOME" a hint of the song??!!! I have tickets to a play tonight and will have to tape the show and watch it when I get home. Bummer! Can't wait to see Clay again. Love that video. Can’t wait for tonight. Clay will be fantasic!! You know, I think Clay is actually a little excited about going back. He might not be so charitable after the show but for now…he seems genuinely pumped up to be there 🙂 Can't wait!!!! Again, I say as the judges said during that season, "Where does that voice come from?!!" Good Lord & Taylor, he's got CHOPS!!!!!! He blew me again away tonight singing, BOTW. It was so funny, I was JUST watching that performance on my Best of AI 1-4, this afternoon. Dum, de dum, dum! Error: Error validating access token: Session has expired on Tuesday, 21-Aug-18 16:13:01 PDT. The current time is Tuesday, 23-Apr-19 18:03:50 PDT.